Based on the 1967 film "To Sir, With Love" starring Sidney Poitier, we celebrate and honor President Barack Obama with a creative twist. 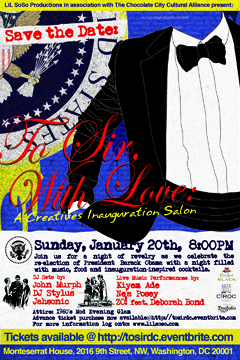 Join us for a night of revelry that includes food, djs, live music performances and inauguration-inspired cocktails, all done with a 1960's mod twist. Attire: Attendees are encouraged to come in their best 1960's mod-inspired evening look. Space is limited. Advance purchase and early arrival, highly encouraged. Deborah Bond, Lil SoSo Productions, Monteserrat House, Washington DC, Zo! Based on the 1967 film \"To Sir, With Love\" starring Sidney Poitier, we celebrate and honor President Barack Obama with a creative twist. Join us for a night of revelry that includes food, djs, live music performances and inauguration-inspired cocktails, all done with a 1960's mod twist. \nAttire: Attendees are encouraged to come in their best 1960's mod-inspired evening look.